The U.S. Action Plan for Combating IUU Fishing and Seafood Fraud outlines 15 recommendations for responding to these issues. Recommendation 6 aims to build international capacity to sustainably manage fisheries and combat IUU fishing and seafood fraud in coordination with a range of partners who share this interest. This website contributes toward that goal by maintaining an inventory of cooperation and assistance activities implemented by the broad community of donors, technical groups, government, and non-governmental organizations working on these issues. We invite your active participation on the site, and encourage you to use the search tools and contact information available here to enhance your work. To search by organization, type the name of the organization in the box below. (Name will auto-fill if available). Click here to see a full list of current organizations below. Please log in to see all inventory entries. NOAA Office of Law Enforcement agents provided two days of instruction on best practices in fisheries evidence collection and a practical exercise on fisheries evidence collection at the Sekondi Naval Base, Ghana. The Sustainable Ocean Fund provides private debt investments in sustainable fisheries, supply chain improvement and marine conservation. SALT is a global alliance for knowledge exchange and action to promote legal and sustainable fisheries through improved transparency in seafood supply chains. The objective of the project is to reduce forced labor and human trafficking on fishing vessels in the Asia-Pacific region. The SNAPPER project aims to enhance sustainability and profitability of deep-slope capture fisheries in Indonesia, through effective collaboration between companies, communities and government agencies. Working with Seafood Traceability technology companies to determine their needs to grow the industry, and improve education and awareness of their services within the global seafood industry. The Trade Associated for Seafood Traceability Technology (TASTT) has been informally created. Formalization and growth of the trade association beyond founding members will be complete by July 2018. A series of tools and resources that will help seafood industry businesses determine their traceability needs and the first steps on how to begin implementing traceability internally and in their supply chains. A project to use ThisFish's traceability platform to verify the Indigenous certification Keshken on seafood products. A project to develop open-source beta software to enable seafood processing companies to improve their internal traceability and production data recording through software called Tally-O. A project to implement consumer-facing traceability on artisanal handline tuna from Indonesia. A project that integrates the warehousing and auction software of the Portland Fish Exchange with ThisFish's seafood traceability platform. A project to set up electronic traceability from boat to plate with some 64 artisanal rock lobster fishermen in Chile. Food companies can help advance decent working conditions in fishing and aquaculture by screening seafood products to learn the actual working conditions producers take on. The International Pole & Line Foundation (IPNLF) works to develop, support and promote socially and environmentally responsible coastal tuna fisheries around the world through on-the-water fisheries improvement, enhanced traceability, advocacy for science-based management, and market engagement. FishWise is a non-profit sustainable seafood consultancy that promotes the health and recovery of ocean ecosystems by providing innovative market-based tools to the seafood industry. FishWise works with seafood companies to improve the sustainability and traceability of their seafood supply chains, as a means to combat IUU fishing and improve human and labor rights throughout the sector. EDF works with seafood industry leaders and other stakeholders to support fisheries that are managed sustainably to ensure both ecological and economic success for the fishery. EDF Oceans empowers people around the world—in 12 geographies that make up 62% of global catch—to manage fisheries sustainably. We equip individuals, institutions and communities with what’s needed to overcome challenges and contribute towards more fish in the water, more food on the plate, and more prosperous communities. USAID carries out research on land and marine tenure to support programs on fisheries and coastal management. USAID Philippines and Rare, with partners Bloomberg Philanthropies, Pinoy Micro-Enterprise Foundation and Encourage Capital, established a Global Development Alliance to expand the use of managed access to strengthen small-scale fisheries. COMFISH promoted sustainable fisheries co-management and supported the government of Senegal’s efforts to reform its fisheries sector. Concept statement for a collaborative pilot project to address IUU fishing. ISSF’s work is directly related to all three Strategies to combat IUU: Industry and Market Incentives, Transparency and Fisheries management Strategies. Our annual report—Best Practices, Better Solutions—outlines the organization’s goals and achievements in 2016 and highlights ISSF’s ongoing commitment to the continuous improvement of global tuna fisheries through science, collaboration, and advocacy, including on IUU activities. The U.S. Coast Guard regularly exercises 16 bilateral fisheries law enforcement shiprider agreements with countries in the Eastern Pacific and in West Africa. These agreements enable U.S. government vessels and U.S. Coast Guard law enforcement personnel to help host nation law enforcement personnel better exercise their authority. Shiprider agreements help close global maritime law enforcement gaps; improve cooperation, coordination, and interoperability; and build maritime law enforcement capacity to more effectively combat illegal, unreported, and unregulated (IUU) fishing and other illegal activity. The adoption of shiprider agreements between other countries and in other regions could help strengthen global maritime law enforcement efforts. The U.S. Coast Guard conducts international capacity building training that has varying degrees of applicability to IUU fishing enforcement. Trainings provided by the U.S. Coast Guard that are related to IUU fishing enforcement fall within three broad categories: general maritime law enforcement, small boat operations, and professional military education. Information regarding the capacity building training carried out by the U.S. Coast Guard can be found in the annual Foreign Military Training Joint Reports to Congress. The USAID/Caribbean regional mission's Caribbean Marine Biodiversity Program (CMBP) seeks to reduce threats to marine-coastal biodiversity in order to achieve sustained biodiversity conservation, maintain critical ecosystem services and realize tangible improvements in human well-being for communities adjacent to marine managed areas. 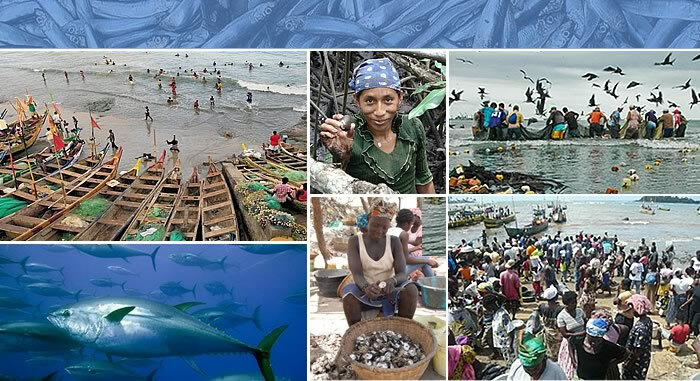 USAID/Ghana's Sustainable Fisheries Management Project (SFMP) aims to rebuild targeted marine fish stocks that have seen major declines in landings over the last decade, particularly small pelagic fisheries that are important for food security and are the mainstay of the small-scale fishing sector. Convention on the International Trade in Endangered Species (CITES) Implementation and CITES Enforcement Training for Management Authority (Scientific and Permit Management) and Customs Officers (Enforcement Authorities) from West African Region (Francophone) Nations: Cabo Verde, Gambia, Guinea, Guinea Bissau, Mauritania, Senegal, Sierra Leone, Liberia, Côte d’Ivoire, Ghana, Togo, Benin and Nigeria. Fisheries Practitioner level training and briefings held in San José, Costa Rica. The GFETW series are trademark events of the International MCS Network. The U.S. National Oceanic and Atmospheric Adminstration, Office of General Counsel and Office of Law Enforcement provide a number of legal and enforcement trainings and workshops focused on the general foundation and understanding of the legal tools available to monitor and enforce fisheries regulations. This regional training workshop focused on strengthening fisheries enforcement in West Africa through legal institutions. The Center for Civil-Military Relations (CCMR) offers a two-week custom-designed Expanded International Education and Training (IMET) and Combating Terrorism Fellowship Program (CTFP) course entitled "Civil-Military Approaches to Maritime Security." USAID/Bangladesh's Enhanced Coastal Fisheries in Bangladesh (ECOFISH-BD) project combats coastal/estuarine illegal, unregulated and unreported fishing and strengthens the ability of local communities, especially women, to extract maximum benefit from coastal environments. USAID/Indonesia's Sustainable Ecosystems Achieved (SEA) project is demonstrating ecosystem-based approaches to fisheries management at local to national scales. The USAID/Philippines Ecosystems Improved for Sustainable Fisheries (ECOFISH) project uses an ecosystem-based approach to fisheries management to achieve social, economic and ecological sustainability and combat illegal, unreported and unregulated fishing. The Oceans and Fisheries Partnership (OCEANS) between USAID, the Southeast Asian Fisheries Development Center and the Coral Triangle Initiative for Coral Reefs, Fisheries and Food Security works to strengthen regional cooperation to combat illegal, unreported and unregulated fishing, promote sustainable fisheries and conserve marine biodiversity in the Asia-Pacific region. Support implementation of APFIC's Trawl Fishery Guidelines through subject matter exchange.